The Costco-meets-Amazon company Jet.com launched Tuesday. There's been a lot of anticipation about Jet because of who the founder is, and how the business could threaten Amazon and Costco. Jet CEO Marc Lore sold one of his most successful companies, Diapers.com, to Amazon (AMZN) in 2010. He left to start his new venture two years ago. So far, Jet has raised $220 million in about a year. "We have an assortment that's vast like Amazon's, and pricing that's similar to a wholesale store and membership," Lore told CNNMoney. One factor to consider is that initially, Jet's inventory will be considerably smaller than Amazon's. At launch, Jet will have about 10 million items for sale. I got the chance to try Jet before its launch and found it easier to use than Amazon, and sometimes significantly cheaper. However, because it specializes in bulk-sized orders, it took a little hunting to find deals on smaller, single-item products. Here are 10 things you need to know about Jet.com. 1. It costs $50 a year to join. That's slightly less than a Costco membership, and half the price of Amazon Prime. 2. 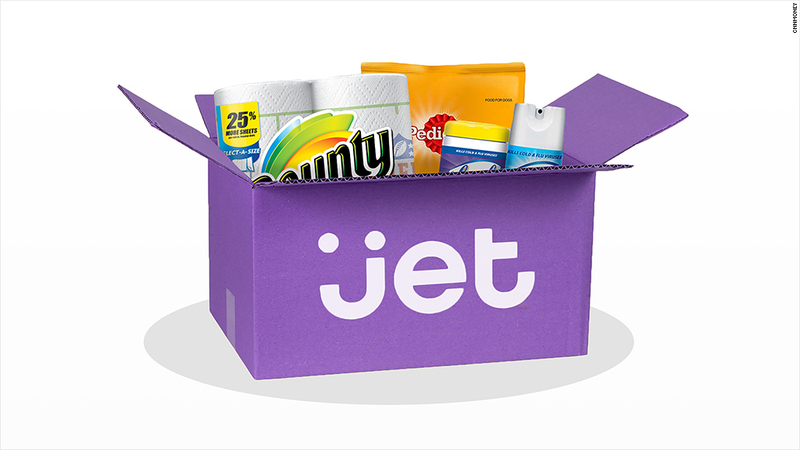 Like Amazon and Costco, Jet allows individual retailers to sell products through its platform. Jet's technology figures out who has the best price for each item and shows that price to the customer. Amazon will often show me a list of the same products being sold at different prices by numerous vendors, which can get incredibly confusing, and forces me to find the lowest priced items. With Jet, I have to trust that it's giving me the lowest price. 3. You can buy anything from groceries and appliances to furniture, books, clothing, and gadgets on Jet. Some of the merchants that Jet works with include Barnes & Noble (BKS), Bluefly, Lenovo (LNVGF), Dell, TigerDirect, and HarperCollins. I compared prices on 20 of the most expensive products within Jet's cold cereal, water, dry goods and pasta, laundry detergent, toilet paper, cleaners, cell phone and tablet categories. Prices were typically lower for boxed and household goods compared to Amazon by a few dollars. Sometimes the differences were as big as $15. Electronics, however, tended to be cheaper on Amazon. 4. On average, Jet says you can can expect to save $150 per year. The site tracks your savings, and if it's less than the membership fee, you'll receive a refund for the difference. 5. Discounts are applied based on a few factors. The greater the quantity you buy, the more you'll save per unit. A small dollar sign icon on the corner of products indicates that those products reside in the same or nearby warehouses as other items in your shopping cart, which reduces shipping costs and ultimately what you pay. Most products have additional savings if you want to waive the right to return. Some merchants that sell through Jet offer discounts for collecting your email address, or if you pay with a debit card versus a credit card. In exchange for dispersing your personal information to yet another company, you'll get a few dimes and quarters worth of a markdown. 6. Shipping and 30-day returns are free for orders over $35. This is standard no matter how many different vendors fulfill your order. Jet also takes care of all customer service. 7. Deliveries arrive in two to five business days. For pantry products, the wait is usually just two days. Amazon Prime, in comparison, offers free two-day delivery for more than 20 million items. 8. Jet currently doesn't offer same-day delivery service. Amazon does in 14 cities. 9. Jet offers a rewards program called Jet Anywhere that lets members accumulate "Jet Cash" when shopping at affiliate stores. 10. Jet will only serve customers in the U.S., Lore told CNNMoney. "We want to be laser-focused," he said.